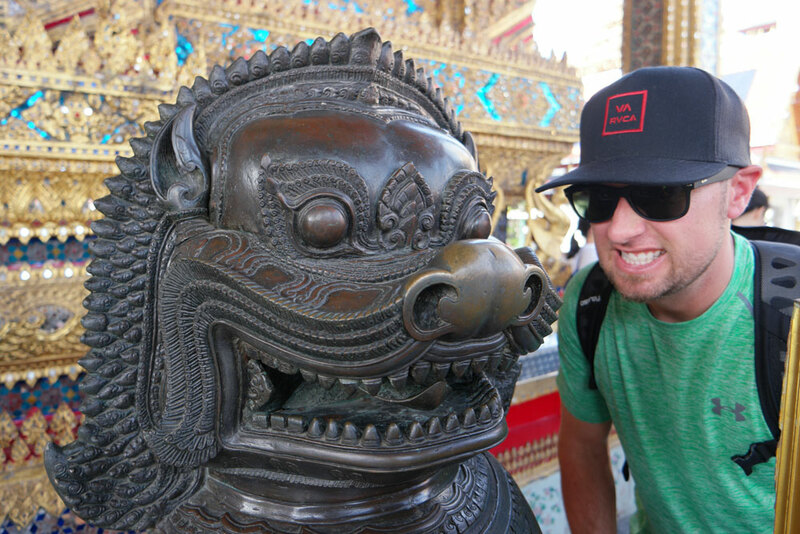 Following our morning walking tour, our afternoon was set aside for visiting the Grand Palace & Wat Pho. 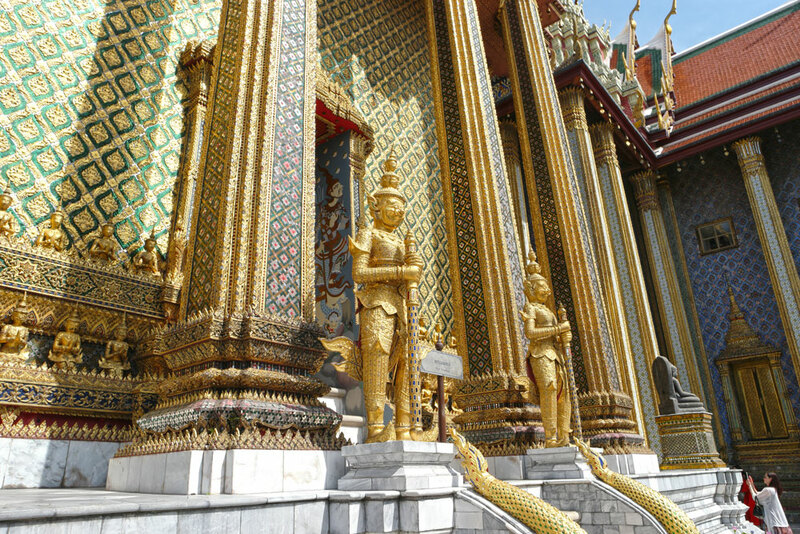 Over 20,000 people visit the Grand Palace every day. The palace’s construction began in 1782 and it was used as the official residence of the Kings of Siam until 1925. 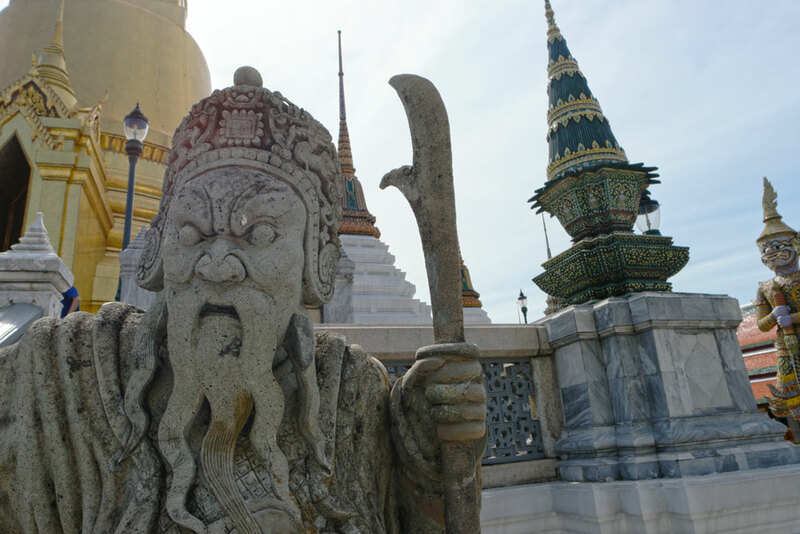 It is now one of the most popular tourist attractions in Thailand. 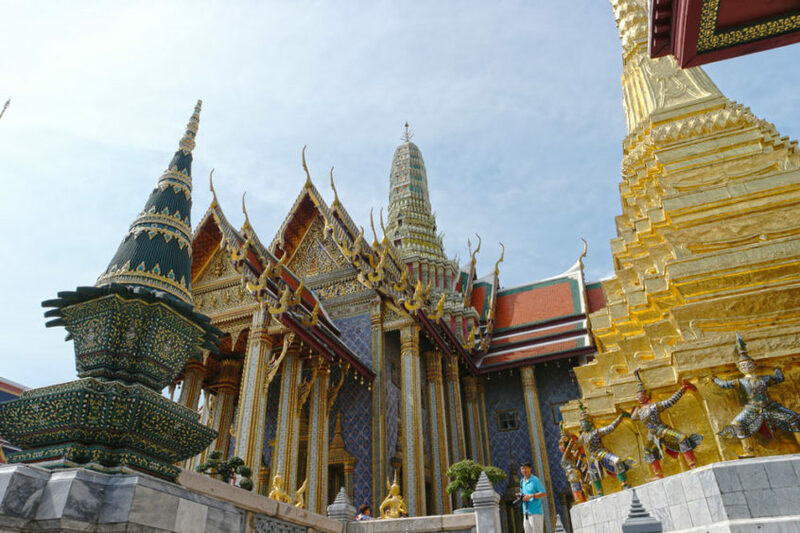 The Grand Palace houses Wat Phra Kaew, the Temple of the Emerald Buddha, which is considered to be the palladium of the Thai Kingdom. 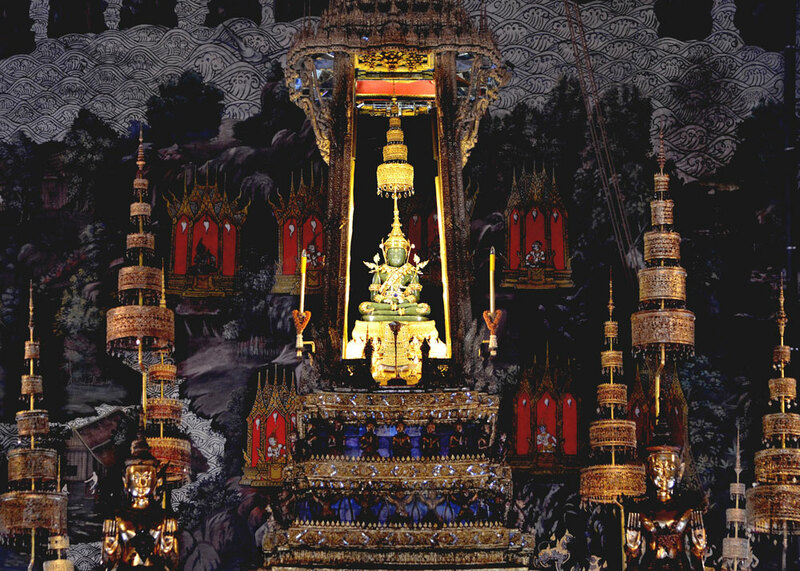 The Emerald Buddha is in reality carved From a large piece of green jade. 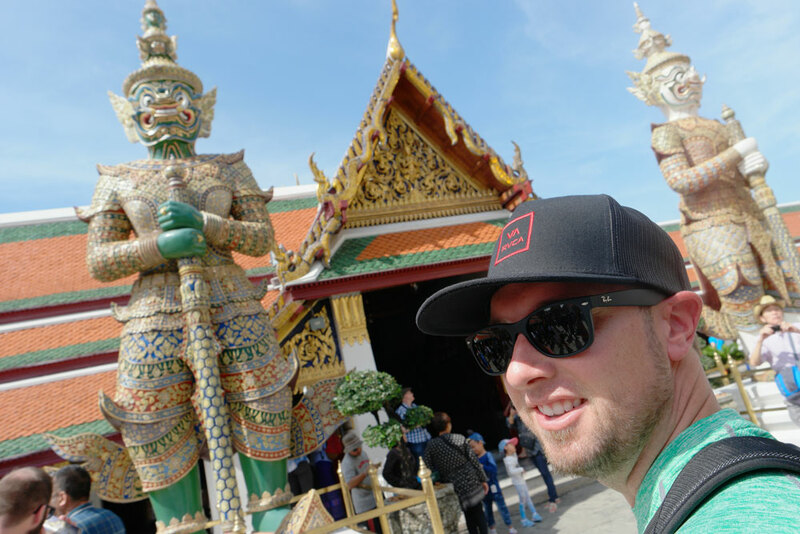 The story behind the 2 foot tall Emerald Buddha is an interesting one. Supposedly, in 1434 A.D., lightning struck a chedi (temple) in northern Thailand and a Buddha statue covered with stucco was found inside. The statue was brought into the abbot’s residence where he eventually noticed that the stucco on the Buddha was flaking away and he saw green color inside. He removed all the stucco and found the Emerald Buddha beneath. It’s home changed many times until it finally reached Bangkok in 1784. The Buddha also wears a different costume depending on the season. 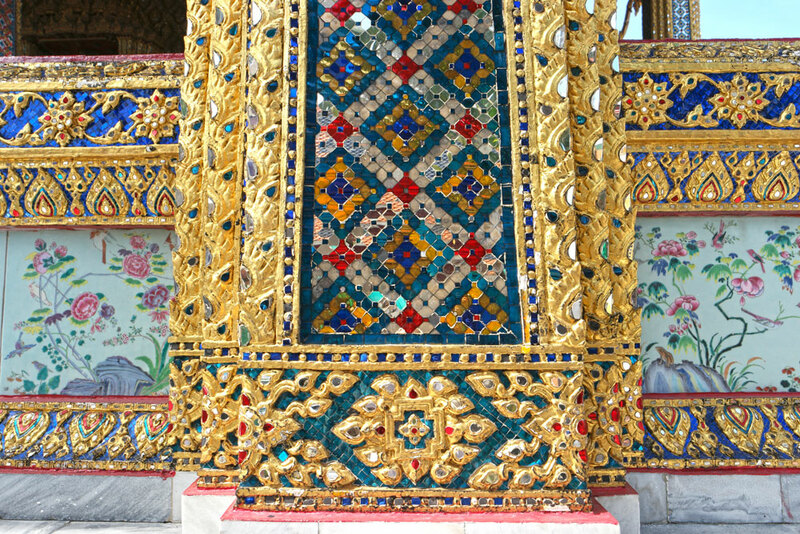 Since we were not allowed to photograph the Emerald Buddha, this photo comes from erininthelioncity.com. Your elbows, stomach, knees & ankles must be covered. If you don’t have proper clothing, you can rent clothing right before the gates using a passport or credit card as a deposit. Though beware, the lines are long. Sandals are allowed despite what you may read elsewhere. My Birkenstock sandals cruised right on through. 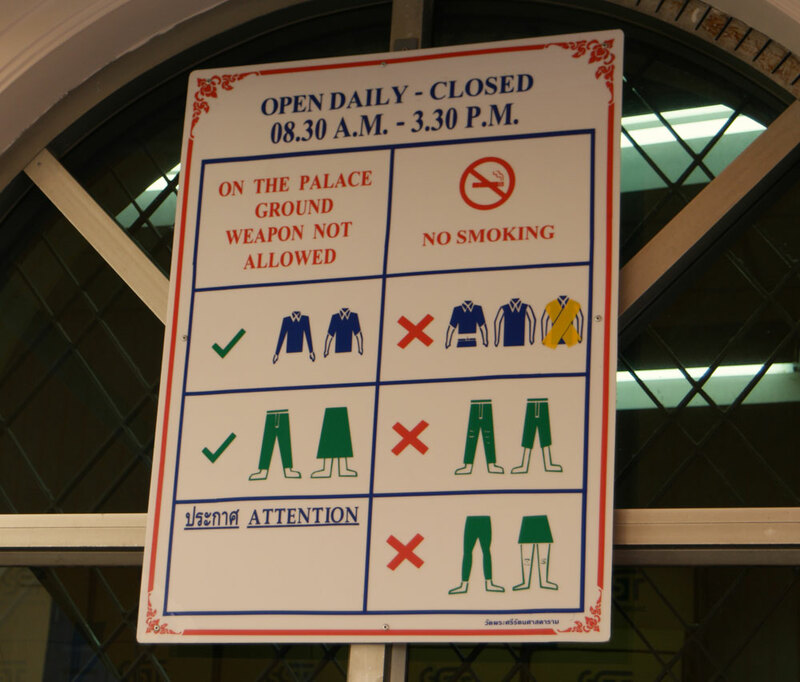 Common scam: If anyone working outside the palace area tells you its closed, keep walking. They will suggest their own guided tour instead where they’ll earn a commission. Free guided tours in English are available at 10:00, 10:30, 1:30 and 2:00. You can rent an audio guide for 100BHT ($3) plus passport or credit card deposit. 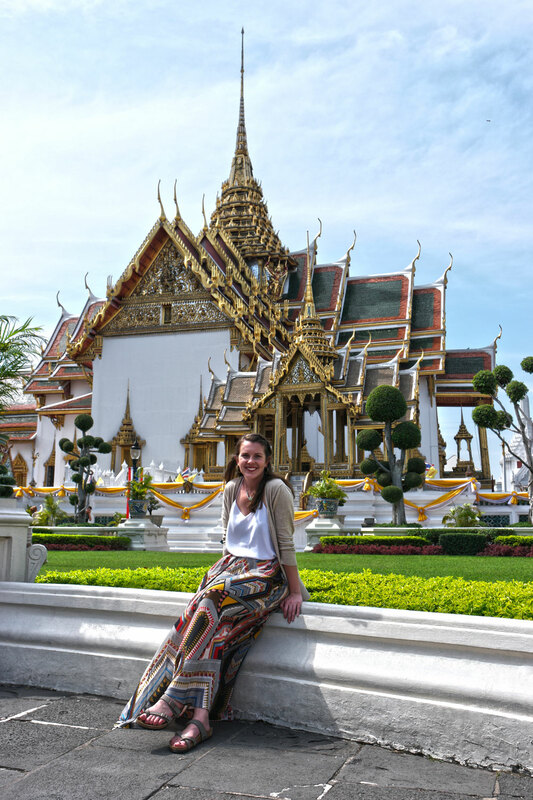 Wat Pho, home of the famous Reclining Buddha, is a short walk from the Grand Palace making both stops completely doable in one afternoon. It’s 150 feet long, 50 feet tall and covered in gold leaf. I was most excited to see the mother-of-pearl designs of the feet but they were unfortunately under construction. The Temple of the Reclining Buddha is open from 8:00-17:00 but I highly recommend visiting the Wat Pho complex at night as well when visitors are scarce. 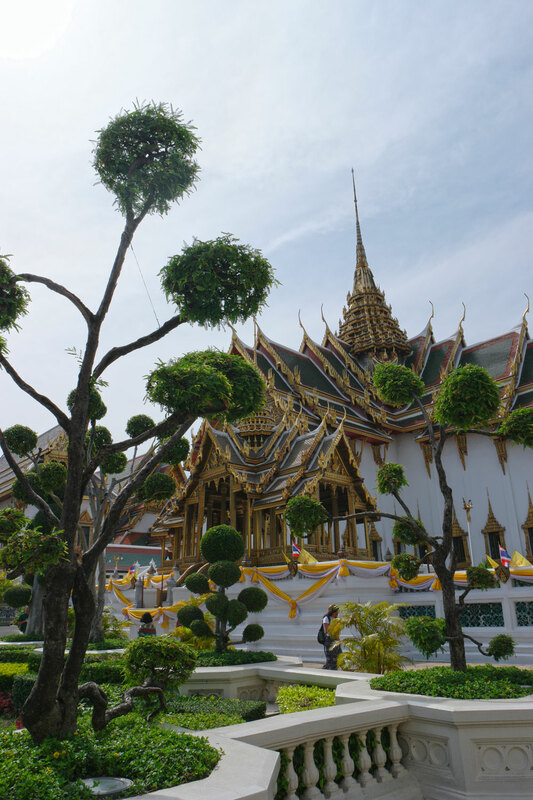 I must admit, walking through the Grand Palace felt a bit like Disney World at times with the tour guides holding their umbrellas high and thousands of people being herded like cattle between beautifully manicured lawns. 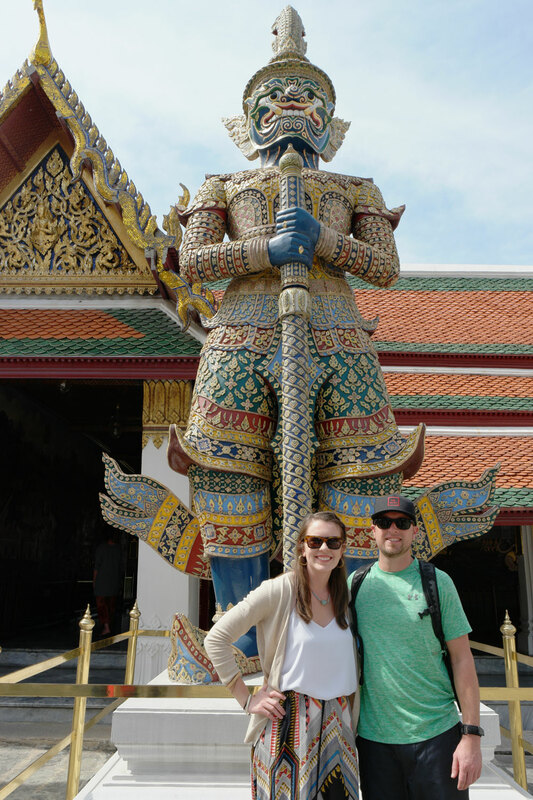 But with this being our first trip to Bangkok, I’m SO glad we made time for visiting the Grand Palace & Wat Pho. Go as early in the day as you can and beat the heat and the tour buses! 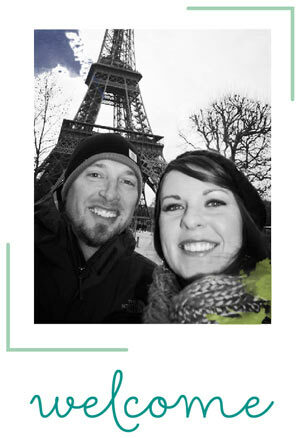 If you’d like to see our full month-long honeymoon itinerary, click here.